Place the strawberries in a strainer and rinse under cold running water. Gently pat dry with paper towels. Reserve 4 strawberries for the garnish. Cut out the hull, or "cap," from the remaining strawberries with the point of a paring knife. 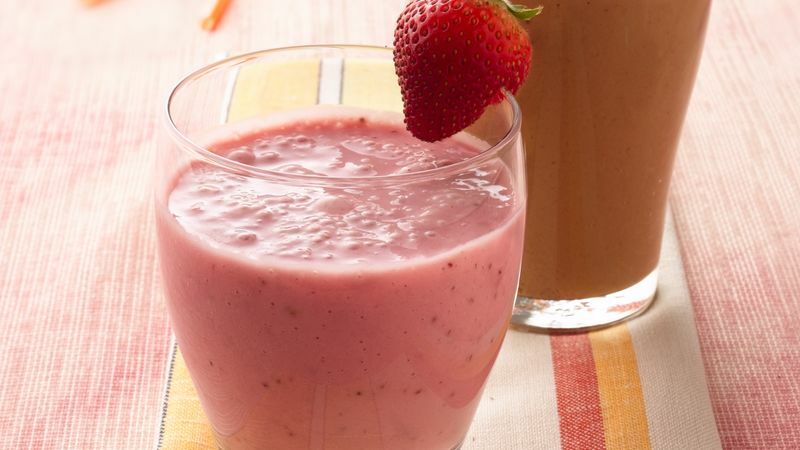 For 90 calories and no fat per serving, use fat-free (skim) milk and fat-free strawberry yogurt. You can use other flavored yogurts such as banana cream pie, mixed berry or key lime pie for a flavor change. For an added touch, leave the green leaves on the strawberries. Make a small cut on the side of the strawberry and slide it on the rim of the glass. Cut out the hull, or "cap," with the point of a paring knife.